There are few if any better cars in the world for classic sports car racing than this 1986 Porsche 962 originally campaigned in the IMSA GTP racing series by Dyson Racing, one of America’s longest-running and most successful racing teams. The Porsche 962 and its 956 predecessor dominated their respective racing series for a full decade into the mid-‘90s. The 962 saga actually began in earnest with the 1982 1,000 km endurance race at Silverstone, where the first works 956 shattered the track record in qualifying and finished second the first time out. Rules affecting driver placement and engine specifications prevented Porsche from entering the 956 in the North American IMSA GTP racing series until 1985, when Porsche extended the car’s wheelbase to move the front axle line ahead of the pedal box and integrated an approved steel roll cage. 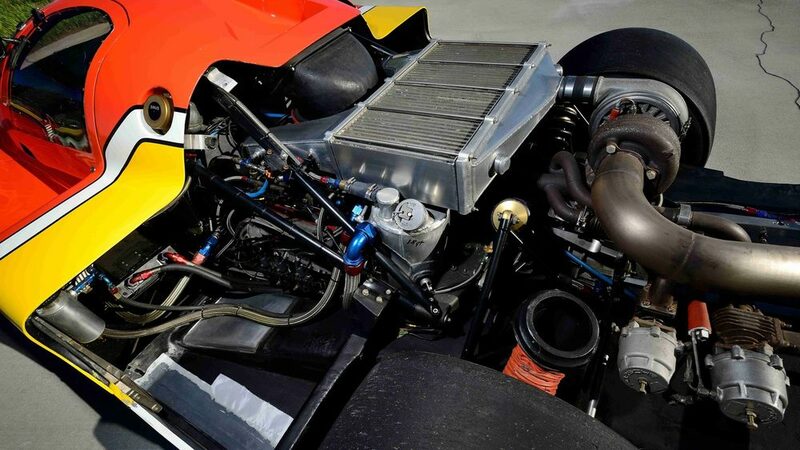 Because IMSA rules also prohibited the use of the 956’s water-cooled twin turbo flat-6, the 962 was powered by an air-cooled unit derived from the Type 935 using a single cam per cylinder bank and a single KKK turbocharger. Mecum Auctions will be offering this example at their upcoming Monterey auction between the 18-20th August, the estimated value is between $1m – $1.2m. For more information on this and other vehicles at the sale, click on the link below. Photos courtesy of Mecum Auctions.